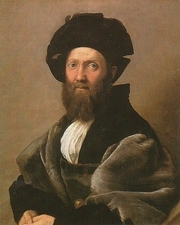 Baldassare Castiglione was born in Casatico in the province of Mantua to a noble and illustrious Lombard family. After receiving a classical education, he served first at the court of Lodovico Sforza, Duke of Milan, then entered the service of Francesco Gonzaga, Duke of Mantua, and then Guidobaldo da Montefeltro at Urbino. Castiglione's service in Urbino gave him an entree to the court of Pope Julius II, where he became a friend of the artist Raphael. He was sent as ambassador to King Henry VII of England in 1513. A few years later, Castiglione married, but became a cleric in 1521 after the death of his wife. In 1524 he was sent by Pope Clement VII as ambassador to the Emperor Charles V. Castiglione's "Book of the Courtier,"published in 1528, was a huge and immediate success. It quickly became the most important book of etiquette for both the bourgeoisie and the aristocracy in Italy and beyond. The work helped spread the values of Italian humanism throughout western Europe. Of particular note, still prized today, were the ideal courtier's qualities of grace and nonchalance, which Castiglione called "sprezzatura." Baldassare Castiglione is currently considered a "single author." If one or more works are by a distinct, homonymous authors, go ahead and split the author. Baldassare Castiglione is composed of 27 names. You can examine and separate out names.